Bryan Bagunas shows the way anew for National University. NATIONAL University secured a twice-to-beat advantage, while Far Eastern University improved its chances of earning the same semis incentive after taking down ousted teams on Sunday in the UAAP Season 81 volleyball tournament at the MOA Arena. Bryan Bagunas, Nico Almendras and James Natividad showed the way as NU routed also-ran University of Santo Tomas, 25-20, 25-21, 25-9. 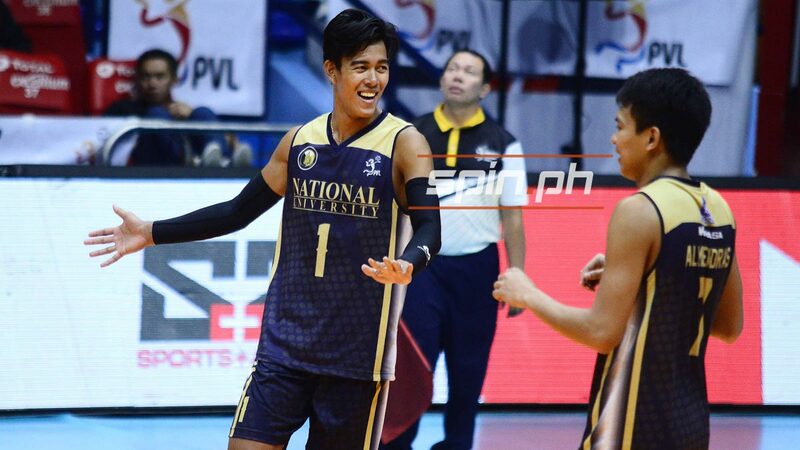 Season 80 Finals MVP Bagunas and rookie Almendras had 15 points each, while Natividad delivered 13 hits as NU cruised to its 11th straight win after an opening-weekend loss. Joshua Umandal scored 12 for UST, which suffered its ninth loss in 13 matches to sit in sixth spot. The Tigers will face UE (2-11) in their last match of the season on April 27. FEU inched closer to a twice-to-beat incentive after beating cellar-dwelling University of the Philippines, 25-20, 25-14, 19-25, 25-9. Peter Quiel led the charge for the Tamaraws with 15 points off 10 attacks, four blocks and an ace. Jude Garcia chipped in 12 hits and made 12 excellent receptions and six digs, while skipper Richard Solis added 11 markers. FEU is running second with a 10-2 record. The Tamaraws battle also-ran La Salle (4-8) after the Holy Week break on April 24. Jerry San Pedro scored 13 and John Mark Millette added 12 points for UP, which suffered its 11th loss in 12 matches. The Maroons face league leader NU also on April 24.